Transparency International’s Corruption Perceptions Index 2012, coming out on Wednesday, once again ranks the Nordic countries among the “most clean” when it comes to public sector corruption. As discussed in a previous post, such good results stem from political will, open government and robust legislation and mechanisms for holding politicians and civil servants to account. However, no country, not even Denmark, Sweden, Finland (more on Finland here) or Norway, can be considered perfect. 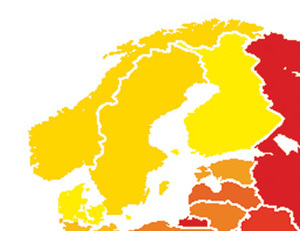 In June 2012, Transparency International published a report on corruption risks in Europe, based on assessments of more than 300 institutions in 25 countries. The Nordics performed well, showing evidence of some of the strongest ‘integrity systems’ in Europe, with well-established, well-enforced laws. Our research shows that these countries have not managed to fully insulate themselves from corruption risks, with the main threats to integrity located at the nexus between politics and business. Conflicting interests and opaque party funding are among the problems that prevent these countries achieving full marks in our ‘integrity test’. Local government corruption is also troubling the region, particularly with regards to public procurement processes. In all four countries, regulation of political party financing showed signs of weakness. In Sweden, there is only a voluntary agreement amongst all but one political party to disclose budgets, and details of donors are not included in this disclosure. This shields influential donors from the public eye, meaning that citizens are unable to judge who could be influencing their national politics. Transparency International Sweden wants mandatory regulation to make parties disclose their budgets and details of donors. Conflicting interests present a significant risk across the region. In Finland, the national assessment concluded that old boy’s networks provide fertile ground for corruption to grow. When those charged with making political decisions have multiple interests and ties with business, decisions could be skewed in favour of those interests. Given this problem, the revolving door syndrome needs to be addressed with waiting periods, and efforts should be made to ensure that public officials and political figures are ready to make their financial interests public. Lobbying should be made more transparent through the use of mandatory registers. The problem is similar in Norway, where there are no written rules regarding conflicts of interest for parliamentary representatives. Codes of conduct should be introduced in Norway to provide representatives with guidance when faced with an ethical dilemma, and to lay out mechanisms for addressing such conflicts of interests. The assessment in Denmark concluded that there are some limitations to access to information, particularly when it comes to cases of exemption in the public sector. Exemption provisions are sometimes misused, denying legitimate public access to information. Our National Chapter in Denmark is calling for the revision of these provisions in order to increase transparency in the public sector. In addition, the Nordics face a somewhat peculiar problem. Due to the fact that these countries frequently feature at the top of the good governance indexes, and are often considered to be the ‘cleanest’, a feeling of indifference towards corruption could prevail. However, it is important to understand that integrity and transparency are not a given. The research carried out by our National Chapters clearly demonstrates that gaps do exist and the risk of corruption is still present. Efforts need to be made in the region by a wide range of actors, including civil society, media, business and government to address these threats to integrity.